You’ve owned a rental property for a few years, and it’s worked out pretty well. You’ve made a little bit of money most years, and you’re looking forward to cashing out the profits. And then you get the tax bill, and realize that most (or all!) of your “profit” is going to taxes. Possibly the most complicated part is how you are taxed on the depreciation you’ve taken over the years. The taxes on depreciation recapture can make the difference between a profitable or not profitable rental experience. Because these taxes are paid at the sale of the property, not understanding them and including them in your profitability analyses can mean that your numbers are wrong. Failing to account for taxes can mean that you think your property is more profitable than it actually is. Note: I’m not an accountant or real estate attorney. Use this to figure out what you know, and what you don’t know, and consult with your professionals to see how this applies to your specific situation. Every year, you depreciate your rental property. Depreciation is a loss on the value of your property, but it only exists on paper. Depreciation is only on the building — you can’t depreciate land. The land portion of your home is often about 20% of the total value, while the structure makes up the other 80%. If you don’t know the percentage for your property then check your property tax statement or your last appraisal. If you’re not depreciating, you should be… because the IRS assumes that you’re depreciating, and they’ll tax you no matter what you’re doing. You’ll pay the recapture taxes whether you actually took the depreciation or not. Don’t forget, depreciation recapture isn’t the only tax you need to worry about when you sell a house. Read Capital Gains Rules for Military Families to see whether you’ll be subject to capital gains taxes. The idea between depreciation is that whatever you’re depreciating is losing value each year. That isn’t always true for real estate. In fact, real estate often increases in value. If you sell for more than the depreciated value of the property, you’ll have to pay back the taxes that you didn’t pay over the years due to depreciation. However, that portion of your profit gets taxed at a rate up to 25%. (Even though you maybe were only benefited by 10 or 15% when you depreciated.) This is a very simplified explanation of the math, but good for estimates. Here is an example: Let’s say you had a house that had a house value (not land) of $100,000 when you put it into service as a rental. You’d take about $3,600 in depreciation each year. If you are in the 15% tax bracket, you’ll pay $540 less in taxes each year due to depreciation. After five years, you sell the house for more than you paid. In calculating the taxes on the sale, you’ll take the $18,000 you’ve taken in depreciation, and pay $4,500 in recaptured depreciation taxes on the sale. (Again, this is the extremely simplified explanation of the math. It’s actually much more complicated.) You pay $4,500 in recaptured depreciation taxes even though you only benefited by $2,700 in taxes during the years you were depreciating! When you’re dealing with a larger property value, or more years, the depreciation recapture taxes that will be due at the sale can add up to a lot. We own a house that we have been depreciating at almost $10,000 per year. After 10 years of rental, we’ll owe about $25,000 in depreciation recapture taxes, plus the other taxes that will apply. Here’s the part of the post where I was going to put in many examples and explanations and charts and pictures about how this actually works. However, there are too many variables and I could not come up with a single example that was clear enough that it didn’t create more questions than answers. 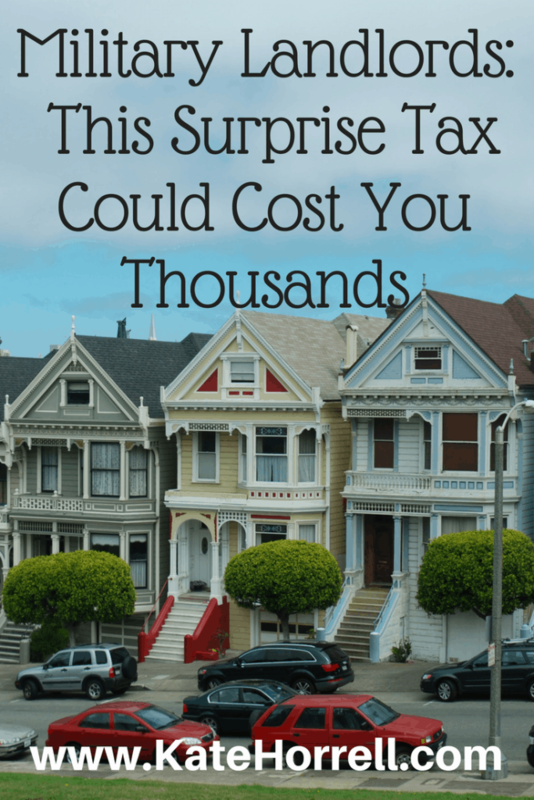 You’re going to want to get a tax professional to handle this in the year that you sell. Go ahead and meet with that person now and have them explain how your situation will unfold. I do not advise doing this yourself or using a tax preparation program. I apologize that I couldn’t include more concrete examples, but I just didn’t think it would be responsible. Can You Avoid Depreciation Recapture Taxes? There are only two ways to avoid depreciation recapture taxes. Both of them are bad for you, but one of them might please your heirs. If you sell at or below the depreciated value, then there is no depreciation to recapture. If the house becomes part of your estate after death, the cost basis in the house is reset. You can delay the depreciation recapture taxes on a sale by reinvesting the proceeds into another property, in a slightly-complicated tax move called a 1031 Exchange, or a Starker Exchange. If this interests you, you need to do a LOT of research and learn all the rules and details. I recommend BiggerPockets.com’s 1031 Exchange Guide: Basics, Resources, and Intermediaries. You can NOT avoid depreciation recapture taxes by making the property your principal residence. You will still owe the taxes when you sell the property. Recently, someone said to me, “Depreciation recapture isn’t just a random tax. You’re repaying the money you saved on your taxes in previous years. It’s a wash.” On one level, they’re right. You’ve saved money on your taxes each year by reducing your income on the property by deducting depreciation. Now you’re just repaying all that savings. Except it’s not that simple. Many military families are in lower tax brackets. Heck, there were many years that my family had ZERO tax liability. So that depreciation taken each year may provide very little value, or it may provide no value at all. But when you sell the house, the recaptured depreciation is included in your income, which often pushes you into a higher tax bracket, meaning you’re paying taxes on that recaptured depreciation at a higher rate. Here’s a real-but-very-simplified example. In 2017, we sold a house. It had been a rental for 8 years, and the depreciation was roughly $10,000 per year, for a total of $80,000 in depreciation. During those years that it was a rental, we were in the 15% tax bracket, so that $80,000 depreciation saved us $12,000 in taxes over the 8 years. On our 2017 tax return, that $80,000 showed up as income on our tax return, pushing us from the 15% tax bracket to the 25% tax bracket. So when we calculated the depreciation recapture, we paid $20,000 in depreciation recapture taxes. As you can see, $20,000 tax payment for a $12,000 tax savings isn’t exactly “a wash.” It’s a little more complicated than this, but you get the point, right? Taxes are an important part of the profit and loss equation of owning a rental property. There are many types of taxes that you may owe when you sell the property, including the taxes on the recaptured depreciation. Understanding these taxes from the beginning will help you make a much more accurate analysis of the value of your investment property, and will help you make better decisions about your property. It’s a slightly tricky formula. Let me try to explain using an office supply (which is where these rules come from.) Let’s say you buy a computer for $1000, and it is on a 10 year schedule. (It’s not, but it makes the math easier. Each year, you depreciate it $100 every year, and each year, your cost basis goes down $100. So, after year one, your cost basis in the computer is $900, after year two it is $800, etc. Let’s say you depreciate the computer for 5 years and now it’s cost basis is $500. But if for some reason your computer was still worth $600, you’d owe taxes on the $100 between its cost basis (now $500 because you’ve depreciated it for five years) and how much you sold it for. This is where it gets tricky. Any portion of that taxable amount (in this case, $100) that can be attributed back to depreciation gets taxed at a rate up to 25%. Then, you pay regular capital gains on the amount above that. So let’s take a super-simple house case. Let’s say your original cost basis was $100,000. Houses are on a 27.5 year schedule, so you would depreciate it $3,636 per year. After three years of depreciation, your cost basis is $89,090. You sell the house for $110,000. You’ll pay depreciation recapture taxes on the $10,910 you depreciated the house, and then you’ll pay capital gains (if not exempt) on the $10,000. I have sold my residential rental house. I have been reading lots of information on the recapture rules. Please explain the words in the last paragraph that say ” and then you’ll pay capital gains (if not exempt) on the $10,000″. In that example, you have a net gain of $20,910, because the cost basis was reduced by the amount of depreciation. The first portion of the gains, $10,910, is attributable to depreciation and therefore taxable at 25%. The second portion, $10,000, is subject to the rules for capital gains, including the 2 out of 5 year exemption and the 10 year military extension on that exemption. This should be required reading for anybody turning a house into a rental! What happens if I purchased our residence in 2005 for $275,000. The FMV was $200,000 when we converted it to rental property in 2013 so we have been depreciating the building portion of the $200,000. Then in 2017 we sold for $234,000. My understanding is I don’t have a reportable gain or loss. Do I still have depreciation recapture? We do fall under the military rule that we lived in the house 2 out of the last 10 years. In regards to the depreciation recapture tax, when you sell the rental property, do all those years built up of losses effect any of those scenarios? Or the un-allowable losses (from previous years) not affect the depreciation recapture tax? I received a gift of property and I want to sell it. what will be my tax liability? how about the recapture of depreciation if I finance the property? This is definitely an issue for a tax professional. And Enrolled Agent or tax CPA should be able to talk you through the various scenarios. It’s clear that depreciation of the house must be recaptured upon sale. But what about the depreciation expenses of the washing machine (appliance – 5 year property) and the water lateral (27.5 year) that were taken while the house was rented out? Must these depreciation expenses be recaptured as well? Ted, I have the same question! I tried to ask my accountant (via email) and he answered a different question. Your wording is much more clear. I will let you know what I learn. Kate Did you get the answer on how to recapture appliances? You’re right. Too many landlords are blindsided by recapture when they sell – – primarily for lack of education. The best advice for 99% of landlords is to employ a CPA at the outset. Profitable buy and hold is more than simply collecting rent, paying the mortgage, and pocketing the difference. The depreciation deduction really only “works” if your marginal tax bracket is 25% or higher. Oh man… I WISH WISH WISH I knew this before I let my hubby sell his condo. He lived in the condo for 3 years, then we moved in together so he rented it out for another 5 years, not really making anything on the rent but still reporting it to the IRS. He was mainly renting it because he owed more than it was worth at the time. THEN last year, the market skyrockets, intrest rates are close to nothing, so his renters go buy a place and leave him with an empty condo. He decides to sell. He pockets about $5k. But now we owe closer to $10k because of the depreciation his CPA has deducted the last 5 years. We weren’t really looking to make a killing, but the rental was a pain and now we somehow are paying more than we ever made, even on the rental payments. I’m very sad and we are pretty upset. My hubby is self employed and it feels like he just can’t catch a break with this tax stuff. Wish we would have known this Kate… thanks for putting it out there. In your example above, I would like to clarify a couple things for your readers. When you depreciate an asset, you do so to offset income you make from that asset. When you sell the asset, the gain is broken into two categories for taxing purposes. The total gain is indeed $20,910. $10,000 of that is taxed as a long term capital gain if you held the asset for longer than a year. Depending on which income bracket you fall into, you will be taxed either 0%, 15%, or 20% on that portion of the gain. The second part of the gain, depreciation recapture is taxed as ordinary income (the reasoning being you used depreciation to lower your taxable income, now the IRS wants to sock it back to you) and depending on what income bracket you fall into, you will pay between 0% (not very likely) and up to 37%. A lot of people use 25% because it falls in the middle of these two extremes but your readers should know, if they make more than $157,500, their tax liability will be higher than 25%. Hope this helps. This clarifies so much! I was unable to find anything anywhere, explaining what you did in a few short sentences. Kate, Thank you for your posts. My husband and I are gifting a condo to our son. We converted it from a rental to personal property in March of this year. The gift date is December 1, 2018. The condo has been depreciated in the amount of $60,000. When do we pay the tax on that depreciation? Kate, We bought a house in 1977 for $23,500 including the lot. We moved in 1992 and the house became a rental in Sept. 1992. We were told at the time if you didn’t depreciate, you didn’t have to repay with selling, so we did not. Years later we heard the law changed and we were not grandfathered in. We don’t know if we were given correct info. We then started depreciating. We are confused on how the recapture works when selling in our specific case. We know we need to talk to a CPA, but would like to try to have a little knowledge on our exact case before sitting down with a CPA. Thank you for any help you might offer. Your depreciation recapture taxes are calculated and due with your tax year 2018 return (the year you dispose of the property). You also will need to file a gift tax form (709) since your gift exceeds the $15,000 annual maximum gift exemption. 1) You should absolutely consult with a tax CPA prior to executing this plan. A CPA, not a “tax preparer”. This transaction is made MORE complicated by the fact that you are gifting (and not selling) depreciated property. It is quite possible that your son will “inherit” a portion of the depreciation and be responsible for those taxes when he sells the property. 2) Gifting appreciating property to relatives (heirs) prior to your death is almost never recommended. It can result in gift tax to you, and higher taxes for the recipient when they eventually dispose of the property. Unless there is a compelling reason to do so, you should reconsider gifting the property at this time. You will have a much clearer understanding of the tax ramifications after getting the counsel of a CPA. Bryan, this question is more complicated than the details you’ve provided, and I am not a tax accountant or Enrolled Agent. I suggest that you work with one of these professionals to ensure that you are paying the right amount of tax on your sale. While I could speculate on your final situation based upon the details you’ve given, that would be irresponsible of me. We have a property that we purchased in 1995 and have been steadily claiming depreciation every year. We plan to sell that property and purchase another property of equal value using the 1031 exchange to avoid ridiculous taxes. My question is what happens to all of that depreciation that we benefited from for all these years? Does the depreciation reset and we begin another depreciation on the new property? Scott, if you do a 1031 exchange, the depreciation (and capital gains, if any) move over to the new house. The only way to completely avoid depreciation recapture is to hold the property (or the 1031 replacement property) until you die. At that point, the depreciation goes away entirely. We sold a home in Sept of 2018. We let our realtor handle things for us as we were living in a different state at the time of the sale of our rental. I spoke to her about the depreciation recapture though and they advised me to speak to a CPA. You’re saying it happens at the time of sale? So they should have taken the deduction for the depreciation recapture then? I was thinking it was when we file our taxes and we did go with a CPA this year who says it didn’t affect or take anything for that from our refund. How do we go about paying for it now? The taxable event occurs at the time of sale, but you report it (and pay for it) on your 2018 income tax return. Your tax return should include a Schedule D, Capital Gains and Losses form and an Unrecaptured Section 1250 Gain Worksheet. Your unrecaptured depreciation should show up on your 1040 on line 13, which will affect your overall income tax due. I’d ask your CPA to show you where and how the sale of the property is reported. Even done right, it is really confusing. We bought a house in 1998 as the primary resident and lived in it until 2009 when we purchased another primary resident. We could not sell the house (horrible market) and rented it out in 2010. We sold the house Dec 2018. Can you use any cost for additions, new roof – things done prior to renting to offset the depreciation? Cindy, this is definitely a question for your tax professional. And you want a tax professional to handle a year with the sale of a house that has been a rental. If you put on a new roof while it was a rental, you should have been depreciating that roof all these years, which would actually increase your recaptured depreciation. If you put on the new roof while it was your property, it will probably impact your cost basis. You want a professional to look over this carefully! Thank you – we hired a CPA that specializes in taxes. We wrote off everything that was done to the rental whatever year that it occurred. New roof, addition etc was done when we lived there and can be added to the cost basis. YAY for keeping all the records. I’m at a loss and do not understand her response, from every link I’ve clicked on in regards to depreciation it says take it now because you will pay for it in the end no matter what. Maybe you can help me understand what this means? You’ve brought up an interesting question. Every tax professional I know refers to the IRS instructions that you must recapture depreciation that was “allowed or allowable,” with allowed meaning that you actually took it, and allowable meaning that you could have taken it. But just this morning, I’ve found two articles suggesting ways to skirt this requirement. I’ve put out some feelers to my tax professional friends and I’ll let you know what they think. New roof on one I order it in Oct. 2017 but they were so busy the roof didn’t go on until Feb 2018 but sold the duplex Oct 2018. ( note when I purchased this duplex it needed a roof ( 12 years later we could repair it anymore my tenants had multiple leaks. ) How will that new roof be handled in my taxes. oh and carpet in one unit & house. These are definitely questions for an experienced tax CPA or enrolled agent. I’m not a professional, and I don’t have enough information to even speculate. Good luck! I’ve owned and rented a residence for 13 years, cost basis $150,000. Could I gift it or sell it to a relative and would the basis reset then? What would be the tax rate (2019) if I sold it myself this year? It’s in my name only, could I gift it or sell it at a low price to my husband? The depreciation recapture tax is more complicated than anything described above. I have searched and found many mentions in tertiary sources of the recaptured depreciation being taxed at 25%, or at ordinary income rates up to a max of 25%. We found neither to be quite correct. In following through the forms (IRS & Turbotax), here’s how it worked for us, and we haven’t figured out why: Taxable income before long-term capital gains and depreciation recapture is $33,354. Turbotax and the IRS forms subtract that from the $77,200 that is the top of the income bracket for which we could still get a 0% rate on long-term capital gains, leaving $43,846 of “room” under that $77,200. our depreciation recapture is 66,507. Turbotax and IRS sort of “fill-in” that $43,846, i.e., $77,200 – 33,354 = $43,846 which goes on Schedule D worksheet and is taxed at an ordinary income tax rate of 12%. I don’t see any logic to that calculation, but I like the tax rate so great so far. But we still have $22,652 of depreciation recapture yet to be taxed ($66,507 of depreciation recapture less $43,846 taxed at ordinary income rate). This amount goes on line 38 and is taxed at 25% as stated right on the form. Our capital gains that were not recaptured depreciation are then taxed at the capital gains rate of 15%. OK, I’m glad our recapture wasn’t all taxed at 25%, but if it is supposed to be taxed at our ordinary income tax rate up to a maximum of 25%, why wasn’t it taxed some at 12% and some at the next bracket amount of 22%, and we shouldn’t even have enough total income to get to the 25% maximum. Can anyone explain why it works that way? Can anyone tell me where the tax code actually states what the tax rates are on the recaptured depreciation? And all my searches have not yet turned up any IRC source for the 25% rate or the ordinary income rate up to 25%. This has been the most helpful post I’ve found on the internet to describe why our accountant just told us we owe $23,000 after selling our rental house in 2018 that we’ve owned for 12 years! Should we have an actual CPA look over our tax return, just to make sure our accountant (who has 10 years experience, but is not a CPA) found every possible deduction? I wish we would have understood this better. Learning a BIG (and expensive) lesson.